It is Sunday, September 21, 2008, 12:15pm. It was raining earlier this morning, but thankfully the rain has stopped, the track is dry, and I am at the starting line of an 1/8th mile track in Osoyoos, BC Canada. In the other lane is my Dad in his '51 Chevy. Father and Son Showdown. This story begins in 1997 when my Dad bought a '51 Chevy Bel Air Coupe. He upgraded the suspension and drivetrain, painted it Candy Apple Red, and started winning car shows. He doesn't trailer his car – he pulls a trailer, pulling one all along Route 66 from California to Illinois. He was having so much fun that he started bugging me to buy a muscle car. Since my first 2 cars were Pontiacs (a '64 and then a '67 LeMans), a GTO was the logical choice, and I ending up buying a Burgandy '66. 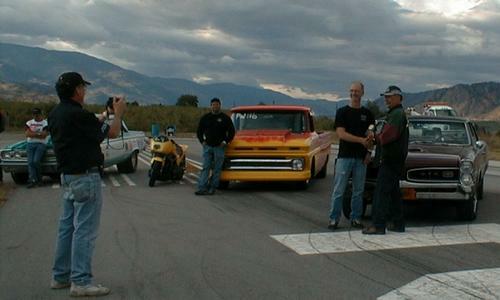 In 2007, at age 70, Dad starts racing his '51, powered by a stroker 383 with a roller cam. We talk about racing each other, but he lives on the other side of the Cascades and the summer went by quickly. By the end of the season, partially motivated by hearing what times I was turning, plans are made for a bigger engine. It's now September 20, 2008, and a 434 ci small block is under the hood of the '51, and I now have a driveline loop so I can run stickier tires. 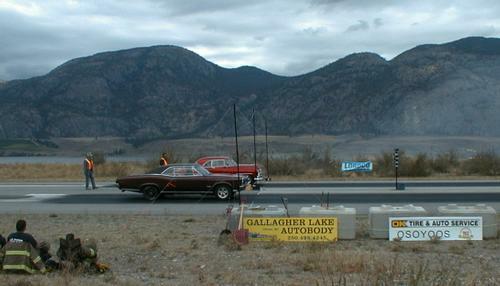 I load the trunk up with tools and my mounted drag radials, and Carolyn and I drive the '66 250 miles to my Dad's in North Central Washington. The next morning we wake up to rain! After giving the rain an hour to settle down, we cross our fingers and drive north to Canada. By the time we arrive, the rain has stopped, so we get the cars ready. During the practice runs, we were both running in the 8.6 second range. Traction is a problem even with my drag radials (I hooked much better at Bremerton 2 weeks earlier.) On the last practice run we managed to line up together. Our first ever race against each other! He then proceeded to run his best time ever, 8.3 seconds, beating my in the process. Damn it! The next run was the first elimination, and we managed to line up against each other again. Dad is running a 5-speed, so he uses his line-lock so he can preload the drivetrain. Fortunately for me, his line lock didn't let go and I sprinted to victory. I think that was my first-ever elimination victory, but it was just a lucky break. On the next run, my dial-in was 8.60 sec, and the other guy was 8.9 sec. He got the head start and I chased him down and passed him just before the finish line! What a rush! My first real victory, and I'm hooked! My 3rd and 4th runs were just like the 2nd - they got the early start and I chased them down and won. I was stunned each time. When I went up for my 5th run I learned that I had won the Sportsman class. Unbelievable! If I didn't have the trophy, I'd think it was just a dream! Good pic's of your cars. Hey, you can't beat your dad!